Nikki and I went on a trip to Johannesburg in South Africa in the period December 13th to December 31st 2004. The main goal for our trip was to see Nikki’s family and friends but we also got a chance to take a look at places like Apartheid museum, Constitution Hill, Soweto, the theme park Gold Reef City, Cradle of Humankind, South African National Museum of Military History etc. 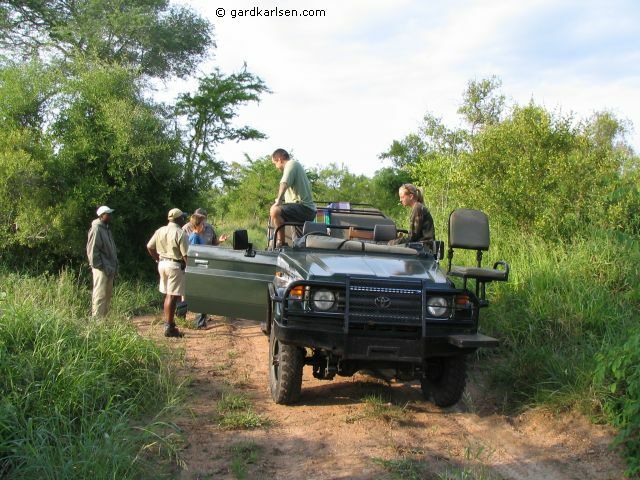 But we also got to go on a wonderful safari at Djuma Game Reserve located in the Sabi Sand Game Reserve near the Kruger Park and this is what this trip report will be all about :-) Get in touch if you have any questions or comments and I’ll do my best to answer. Before we went to South Africa this time, I had been to Johannesburg and South Africa 3 times before. 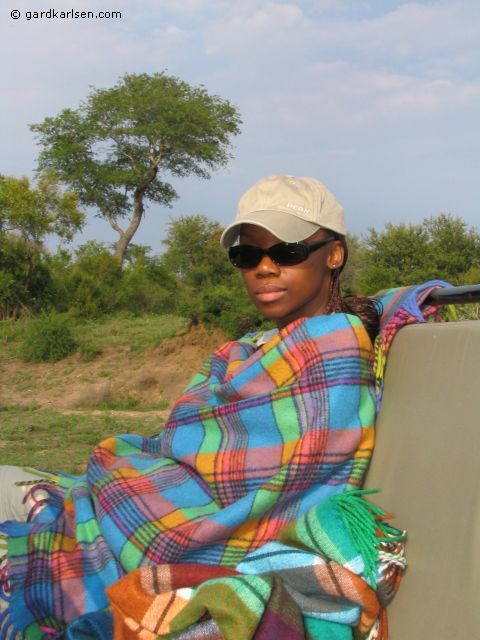 But I had never been on a safari before and this is one of the things people associate with South Africa. 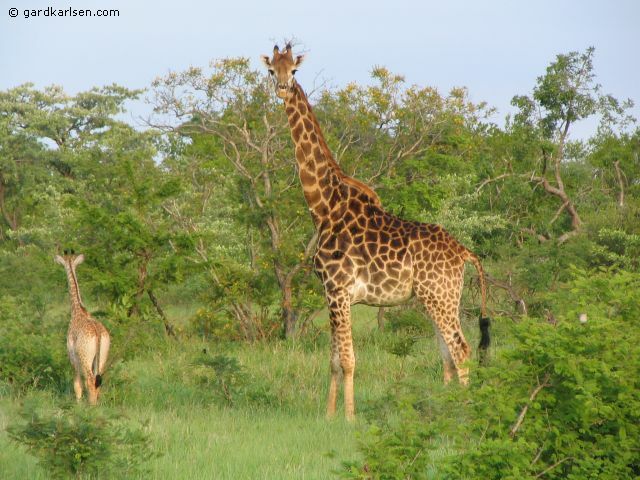 We were not quite sure where we should go on the safari but we decided to go to the Kruger Park area. In the end we booked our safari through Siyabona and we booked at a place called Djuma Vuyatela Game Reserve which belongs to Sabi Sands Game Reserve. 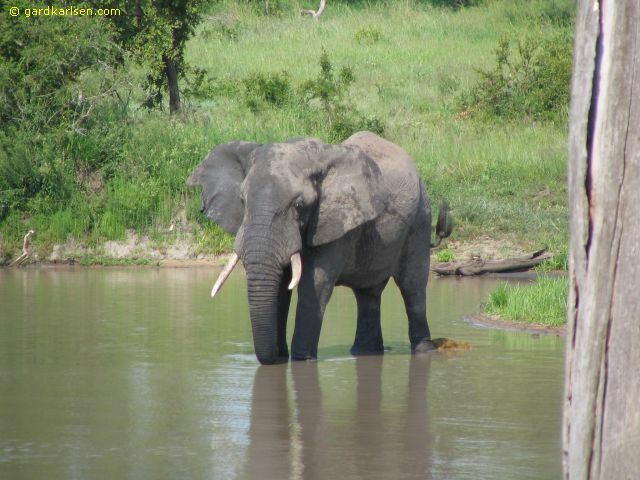 Our trip included the flight from Joburg, more or less all inclusive at the camp, morning and afternoon drives etc. 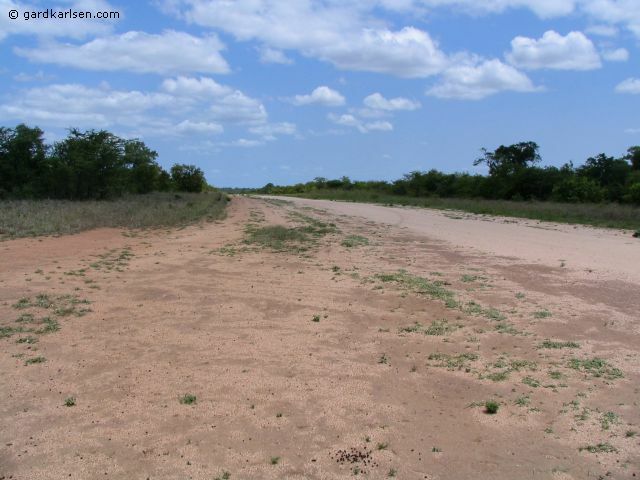 Remember that the Kruger Park is in a malaria area so if you go there you should consider taking malaria pills. We went to a travel clinic in Joburg and got a prescription for Malarone pills (they go under the name Malanil in South Africa). These pills are quite expensive (about 450 Rand per person for a 3 day stay in a malaria area) but there are not that many side effects and you only have to take it a week after you return for the malaria area. You will get concise information about what to do to avoid malaria - mosquito repellent, use long sleeves and pants etc. Lets go out in the bush! After a few days with the family in Joburg, we went to Joburg International Airport on December 17th to catch our plane to Djuma. When we checked in the lady behind the counter said “See you later”. I thought this was quite odd but when we went to our gate and were ready to get on board the plane the same lady was checking our tickets. She was also the driver of the minibus that took us to our little plane :-) Soon we were of in a tiny 8 seats plane (this includes the 2 seats for the pilots) and on our way to the bush. After about 1 hour and 15 minutes we started descending and we were aiming for a small dirt road in the middle of “the bush”. The pilots seemed pretty confident and the landing was not a problem at all. We were picked up buy a Toyota Landcruiser and driven to the Djuma Vuyatela lodge where we were greeted by Mark Labushagne (Manager at Vuyatela) and shown to our room. 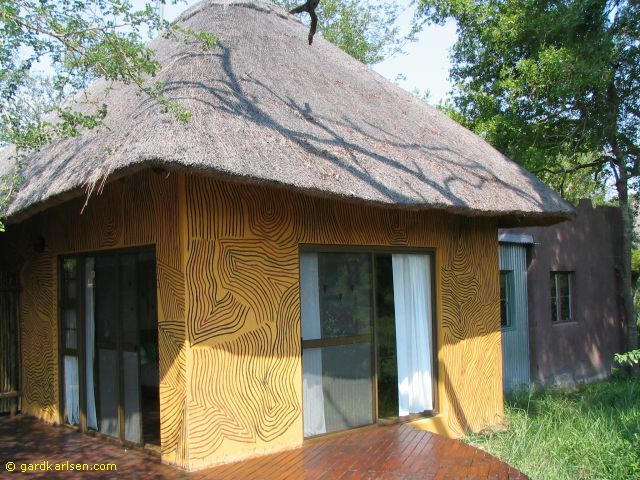 There are only 8 chalets at Vuyatela and we got number 1 which is located close to the main building. 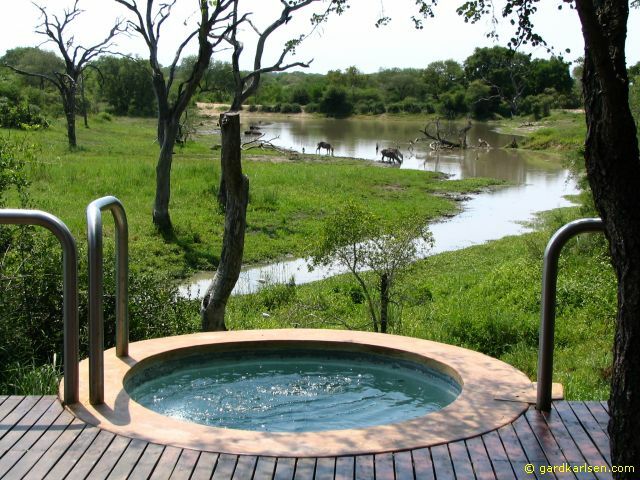 I think this might be the best chalet because from the private deck we had a wonderful view of the watering hole which is located right next to the lodge and we could see animals stopping to drink on a daily basis. The room itself was very impressive. When we came to the chalet we went through a gate where we reached our own private deck with a couple of sun beds and a plunge pool. The entrance to the room is through sliding doors and inside we found a big king size bed with a mosquito net around it. 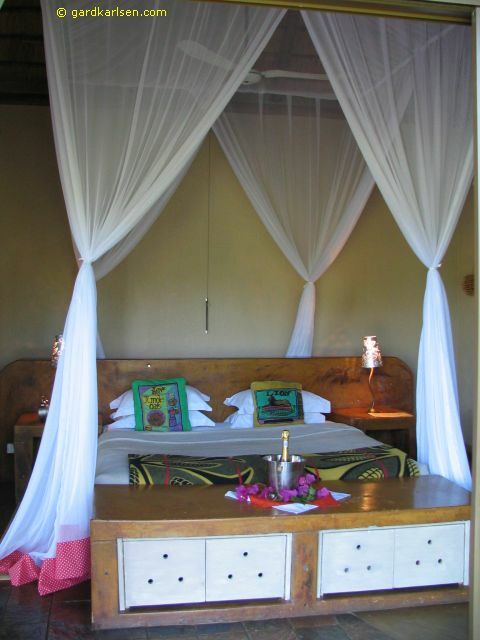 There were also mosquito nets within the sliding doors and air conditioning (with remote control). The welcome also included a bottle of sparkling wine in a bucket of ice at the end of our bed. The room itself continued into a hallway where we found a wardrobe with hangers and shelves. In here there were also a desk and a chair. The hallway leads to the bathroom which was interestingly decorated. We had two sinks, a large bathtub and an outside shower. In the bathroom there was a box that included stuff that you might need….sun screen (SPF 15), mosquito repellent and the usual shampoo, moisturizing cream etc. We also had lots of towels and a robe each. 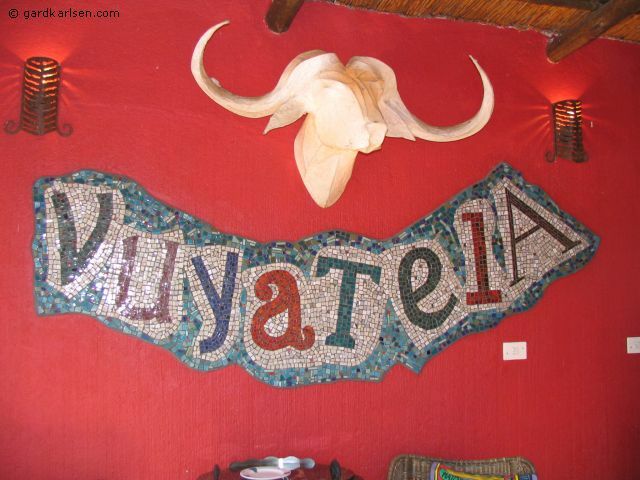 The whole place was decorated in a uplifting and colorful way (a sort of modern homage to South African tribal art) and the same goes for the rest of the Vuyatela place.There was also a little room next to the main room. This room had a small fridge with cold drinks, a water boiler to make tea and coffee, some chairs around a table and some books to read. 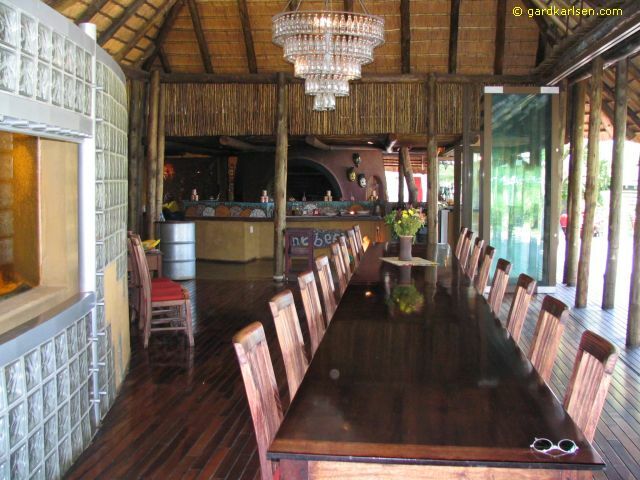 This is where we got our morning tea and coffee before going to the safari. After we had unpacked some of our stuff, we got into our swim wear and jumped into our little pool to cool down a little bit because it was hot indeed. At about 4 pm we had afternoon tea/coffee and got something to nibble on before we got ready to get into the Toyota Landcruiser. Before leaving we were all asked what we wanted to drink and they brought along a cooler bag so that we could have a cold sundowner and eat some biltong. We were 8 people in the car including Charles (our guide and driver) and a tracker. We didn’t drive very far before we got off the dirt road and into the grass. And before we knew it we were only a few meters away from a pride of lions. The guide told us that they had killed and eaten a Blue Wildebeest earlier and now they were just resting. 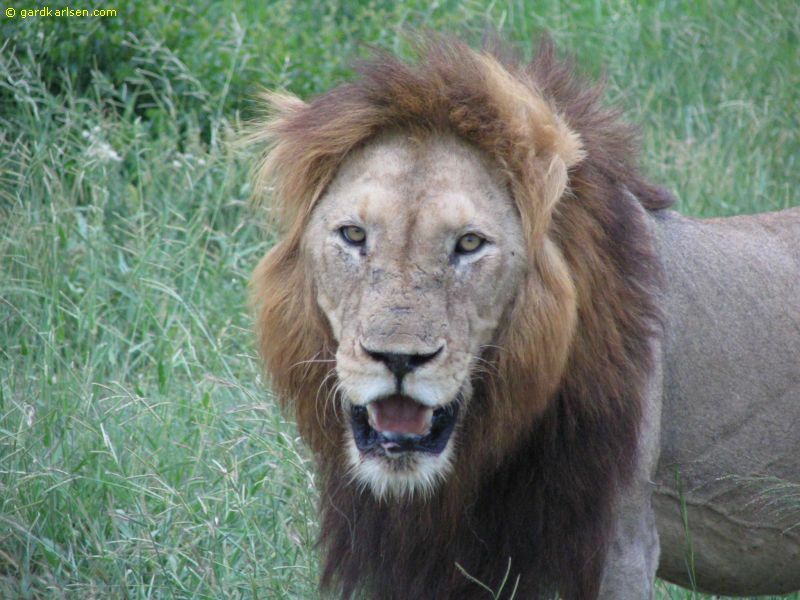 It was amazing and scary to be this close to lions…at least when sitting in an open car. I don’t think I would have spotted them if I was on my own. 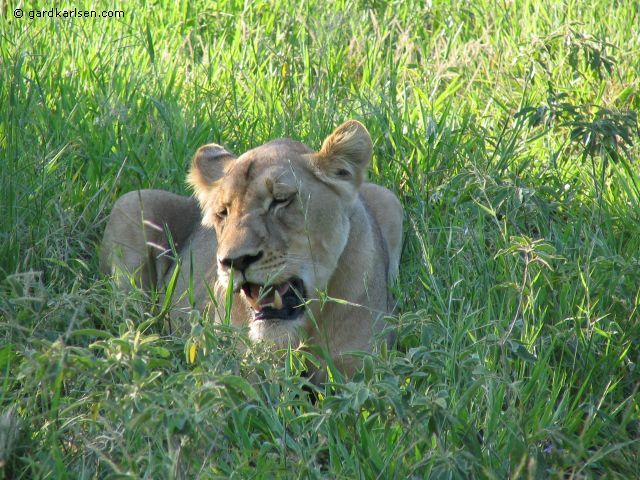 Due to the rain in December the grass had grown and when the lions were laying down it was very hard to spot them. We continued to drive on the dirt roads and Charles was in contact via radio with the other Vuyatela cars to share information on where to find animals. 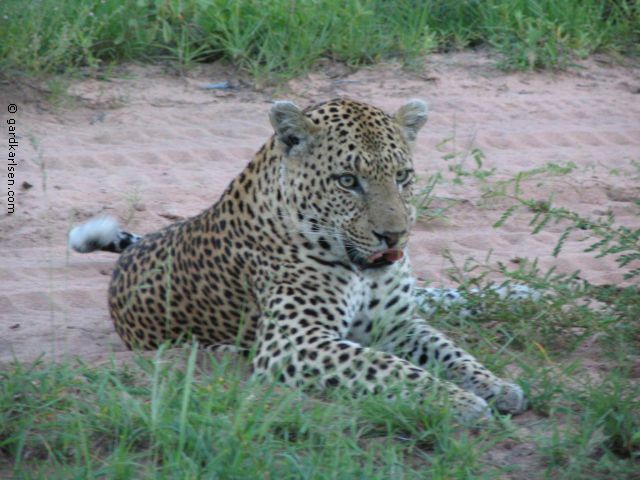 We drove past some buffalos and antelopes but our main goal was to find a leopard. Charles and the tracker had picked up tracks and they kept on getting out of the car to look at it and for a while it looked like we were just driving around randomly. But all of a sudden we found it not far from the dirt road we were on. The leopard got up and walked right past our car and it was even scarier then getting close to the lions. We followed it for a while before we drove to park to enjoy our sundowners. When we got back to the camp we had a little bit of time to freshen up before we went up to the main house. I had a couple of beers and Nikki enjoyed her Savanna Cider and we were getting ready to dine with the other guest. But then we were told that we would dine alone at our chalet :-) When we got to our room a table had been set up on our private deck and there were candles around on the deck. When we sat down we were served a tomato soup as a starter with sunflower bread on the side. The main meal was either chicken or tenderloin and the dessert was bread and butter pudding. It was a strange experience to sit outside and look out into the darkness while eating a good meal and listening to the sounds of nature. All the other guests where South Africans by the way and that surprised me a little bit. I thought that this would be mainly a tourist spot. At 5 am we heard “a friendly knock” (as the manager Mark put it) on our door and it was time to get up. Tea/coffee water was already boiled for us in our little dining room next door and there were also some rusks that we could nibble on. At 5.30 it was time for departure and we got into our Landcruiser again. Even if the temperature was pleasant at the camp, it got a bit cold when we were driving. Fortunately there were blankets in the car that we used to keep warm. We started out where we saw the lions the day before. The lions had gone and there was not much left of the Blue Wildebeest….a skull, spine and ribcage was basically all that was left and it was eaten clean. On the road that day we drove paste Blue Wildebeest, giraffes etc. At one point we were driving pretty fast on the dirt road and all of a sudden we stopped. Charles backed the car up and all of a sudden we saw a big elephant in between some trees. It just shows that Charles was pretty awake…driving and spotting animals at the same time :-) We came to a water hole in the end and in the water we saw three elephants playing around. In the lake we could also see the ears of a hippo that was happily submerged in water. Along the route we used the “Djuma check list” that we got on arrival. This was a little booklet that contained names of animals, birds, trees etc and we could just check of when we saw the different “items”. 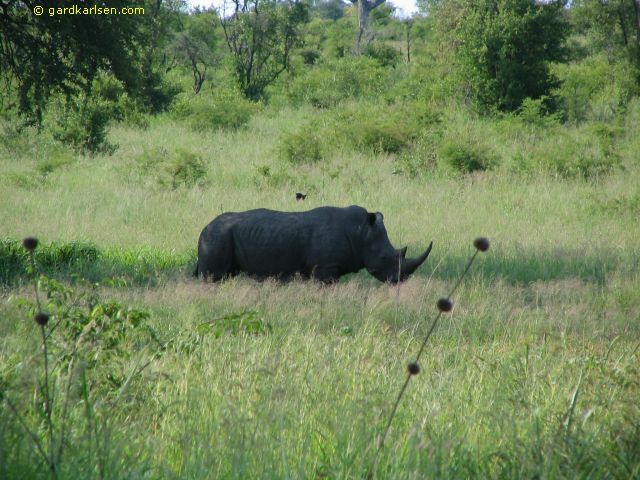 At one point we got out of the car to go trekking a bit to see if we could find a rhino. Charles led the way with a big rifle but I was not feeling that safe anyway. We didn’t find the rhino on this little walk but we found it later on when we were driving. Charles didn't want to get to close to it but it was pretty amazing to see it walking about. Later on we also had a stop next to a little lake. Charles and the tracker pulled out a table and flasks and then we were ready to have some morning tea/coffee (with Amarula if you wish) and some muffins. We were back in the camp at about 8.30 am and then it was time for breakfast. All the guests and all the guides sat down together and enjoyed a selection of cereals, eggs made the way you want it, toast etc. It was very nice to sit down with the guides and management and have breakfast. Most times when you go to a resort you have the guests and then you have the employees. But at Vuyatela there was a nice mix at the table of guests and employees and it made us feel like we were visiting some friends. Getting up at 5 am takes its toll :-). So between breakfast and the afternoon drive we didn’t do much apart from lazing around. 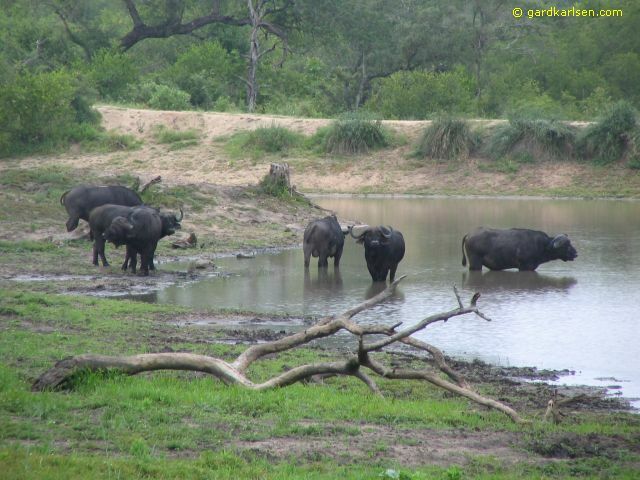 We enjoyed some cold drinks, read a good book and watched the water buffalos relax at the water hole. I was hoping to go on a bush walk but this was cancelled because it was too hot. I was a bit disappointed by this of course. We had a light lunch at about 1 pm and at about 4.30 pm we were ready to go out on another game drive. Once again we came across the pride of lions that we saw the day before. They had moved to another location but they still looked pretty full from the meal that they had the day before :-) It is a pretty scary feeling to see a big lion getting up and looking right into your eyes. In other instances they looked just like a bigger version of cats. We also came across other smaller animals on our drive…kudus, antelopes etc. At night it was dinner once again. Most of the other guests had left so we were only 4 guests there at one point. But it was nice to have dinner, some nice South African red wine and talk to the other guests and the management. Once again we were woken up at 5 am. On this last drive it was only Nikki and I in the Landcruiser together with Charles and the tracker. It was a pretty grey morning and in the end if started raining. We didn’t get that wet because we had been equipped with rain ponchos when we left. We drove around for a while without seeing anything and it looked like all the animals had taken shelter. 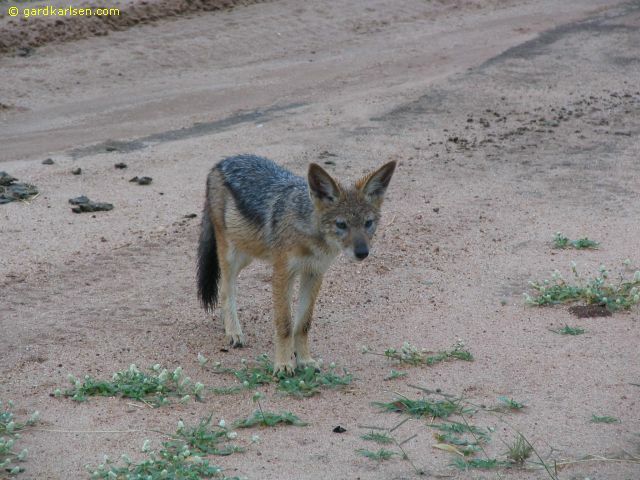 But in the end we came across a family of black backed jackals and we also found a new pride of lions. 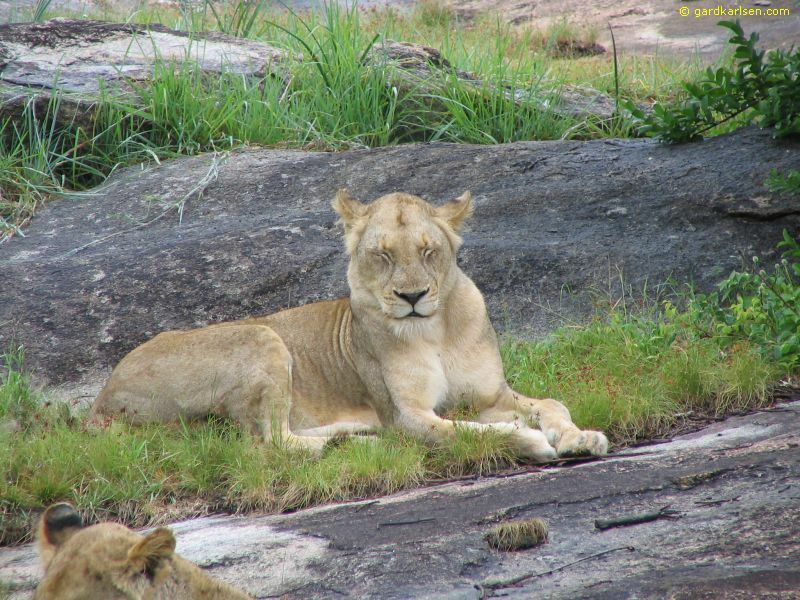 These lions were also just relaxing like the other ones that we had seen the previous days. 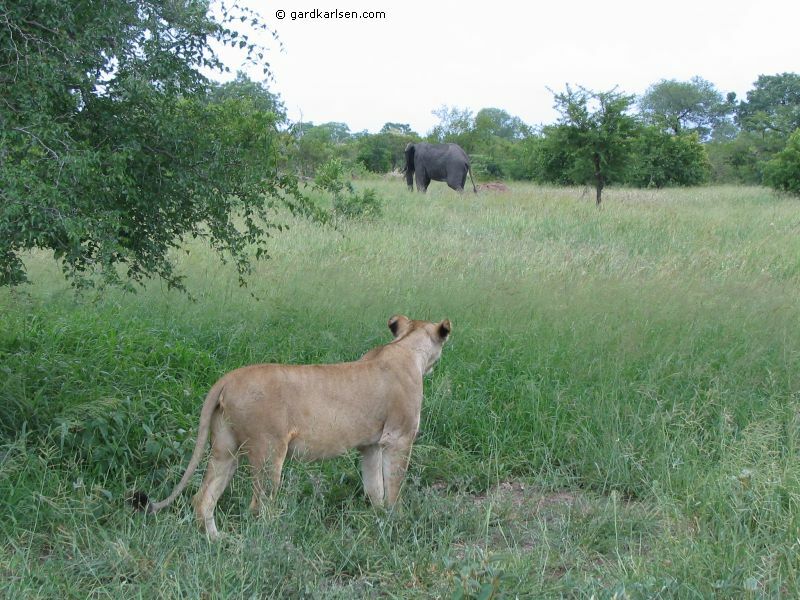 We also came across 2 male lions and an elephant in the end.We came back to the camp at about 9 am and had a large breakfast. Due to the rain that morning some pretty big snails had come out of their hiding. 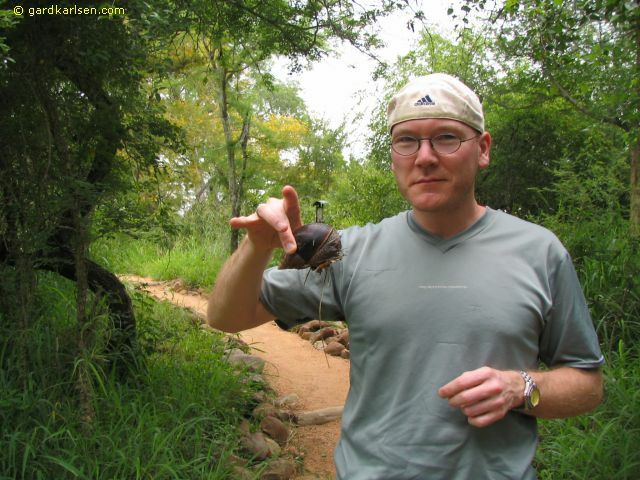 These were called Giant Land snails accordning to one of the other guests and they were huge :-) Norwegians complain about the slugs we have here in Norway in the summertime but they are nothing against these monsters :-). At about 1 pm it was time for us to return to Joburg and we were driven to the little air strip again. A plane was waiting for us and after climbing on board we drove to the other side of the strip. This was done to lift up against the wind but also to make sure that we scared away the giraffes and the zebras that were on and close to the runway. The flight back to Joburg was pretty bumpy as we ran into a thunderstorm on the way. 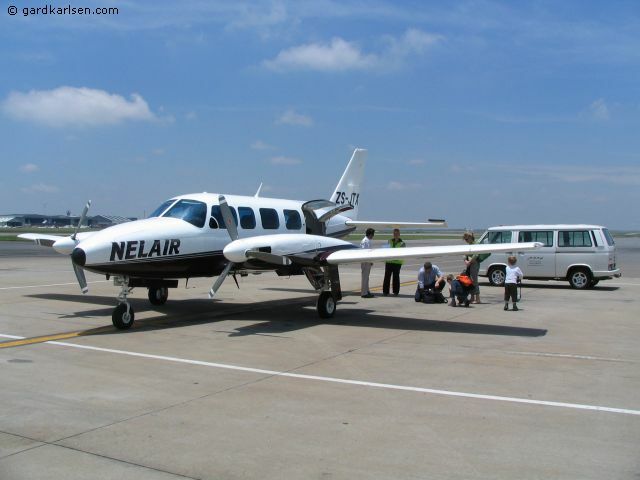 But the pilot managed to land safely at Johannesburg International Airport. 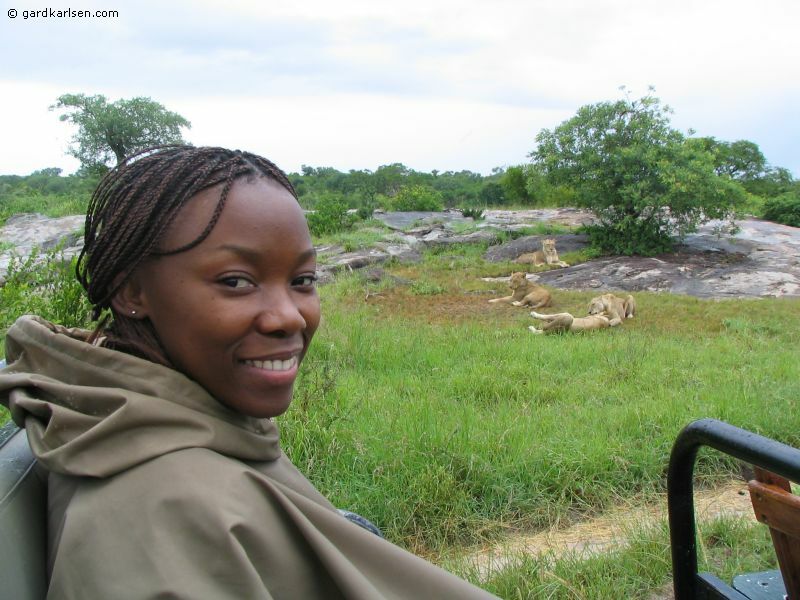 We paid about 10.500 Norwegian kroner (about 1700 US dollars) each for the safari including everything. For us this was pretty expensive but we figured that this would be a “once in a lifetime experience” so we went for it. For the money we spent we got an amazing experience. We got so close to animals that I have only seen on TV and in zoos, we got to see the famous “big five”, we got a room that was amazing and a staff that was so nice and friendly. So the questions is really was it worth all the money? Well, it is always hard to set a price on a unique experience. Some things are just priceless I guess. 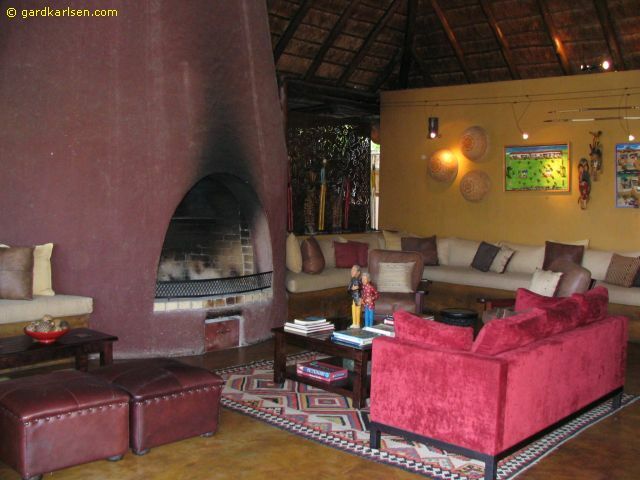 I still think that it is expensive but we enjoyed our 3 day stay at Djuma Vuyatela. Vuyatela means “come and visit again” according to the Djuma homepage. I wouldn’t mind going back there once in the future.